At one point in the meeting, during a tense exchange about contingency plans for dog-walkers, [police Chief Inspector] Rhodes let slip that Operation Discuss (the codename for the Bilderberg security operation) had been up and running for 18 months. Residents and journalists shared an intake of breath. “Eighteen months?” The reason for all the secrecy? “Terrorism”. After 59 years of Bilderberg guests scuttling about in the shadows, ducking lenses and dodging the news, that’s the rationale we’re given? The same rationale, presumably, is behind the Great Wall of Watford, a concrete-and-wire security fence encircling the hotel. As ugly as it is unnecessary, it looks like the kind of thing you throw yourself against in a stalag before being machine-gunned from a watchtower. Appropriately fascistic, you might say, if you regard fascism as “the merger of corporate and government power”, as Mussolini put it. The same threat of “terrorism” was used to justify the no-pedestrian, no-stopping zones near the venue. The police laid out their logic: they had “no specific intelligence” regarding a terror threat. However, in recent incidents, such as Boston and Woolwich, there had been no intelligence prior to the attack. Therefore the lack of any threat of a terror attack fitted exactly the profile of a terror attack. The lack of a threat was a threat. Welcome to 1984. The audience was an odd mix. Half were residents from around the venue worried about the possibility of tyre-damage to a strip of lawn; the other half were journalists from around the world worried about the geopolitical implications of a conference at which BAE, Stratfor and General Petraeus will be discussing “Africa’s challenges”. Both halves were worried about the funding for the gigantic security operation. The police assured sceptical residents that the conference would be “cost-neutral” for Hertfordshire, thanks in part to a “donation” from the conference organisers. This “donation” will have come, in part at least, from the Bilderberg Association, a registered UK charity that takes “donations” from BP and Goldman Sachs. Click here to read his full article entitled “Bilderberg 2013: welcome to 1984” published by the Guardian on Wednesday 5th. If you are concerned about transparency or lobbying, Watford is the place to be next weekend. Whether the delegates reach out to the press and public remains to be seen. Don’t forget, they’ve got their hands full carrying out the good works of Bilderberg. The conference is, after all, run as a charity. Here is the definition of “bribe”: Something, such as money or a favor, offered or given to a person in a position of trust to influence that person’s views or conduct. So surely then, every form of lobbying is a kind of bribery. Just imagine, for example, if my college discovered that I or any of my colleagues were accepting cash payments (or other ‘gifts’) from students – they would rightly sack us on the spot. Would it make any difference if I told them that the students were only “lobbying me” about their coursework, or would it be deemed more acceptable if I had “registered their interests”? Of course it wouldn’t! So in what way is lobbying not bribery? That said, some kinds of bribery are more prosecutable than others. So was Prince Bernhard ever criminally charged after accepting a $1.1 million bribe from Lockheed? Of course not, after all he’s Prince Bernhard. Although apparently he was forced “to step down from several public positions and was forbidden to wear his military uniforms again.”4 Rough justice. Charlie Skelton is doing an excellent job again this year, and when, later today, I finally make it down to Watford myself, perhaps I’ll happen to run into him. If not then I’d certainly like to express my gratitude to him here before I leave. last, but certainly not least, I notice the recently disgraced Gen David Petraeus – why he, we might wonder? And so to Watford… I’ll definitely be keeping an eye out for Mark Carney who has attended previous meetings at St Moritz (2011) and Chantilly (2012) and is about to replace Mervyn King as the next Governor of the Bank of England. Various livestream broadcasts of the event can also be found here. 1 From Adam Smith’s Wealth of Nations, Chapter X, Part II, p. 152. Coalition of Resistance is organising a protest on Budget Day, Wednesday 21st March at 11:30am outside Downing Street, London. The event, which has been organised with the cooperation of Campaign for Nuclear Disarmament, the Public and Commercial Services (PCS) union and Stop the War Coalition, and is timed to coincide with Chancellor George Osborne’s departure from Downing Street on his way to present the budget to the Queen. The message will be ‘Not one more cut to public spending’, ‘Welfare not Warfare’ and ‘Scrap Trident’. Coalition of Resistance is calling for volunteers who can help on the day to please phone Sam on 07872 481769.
the answer to TINA… is TRISH! There is no alternative (shortened as TINA) was one of Margaret Thatcher’s favourite slogans. Those who repeat this slogan today, do so in defence of the same neoliberal agenda that Thatcher’s policies first helped to establish during the 1980s. They believe that only the “freedom of the markets” is sacrosanct, and oblivious to the hardship and brutal oppression which such policies have brought to so many countries around the world, they stand firm in their conviction that we are living under the best of all possible economic orders. In this sense, they are fundamentalists. 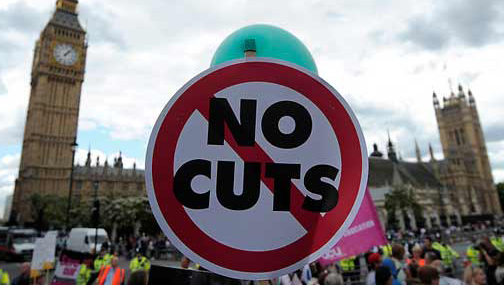 Whilst those who use it to defend calls for the latest round of “austerity measures” are also saying that making savage cuts to government spending is the only way to rescue ourselves in these times of economic crisis. That we must sacrifice everything in order to satisfy the market. Yet all of this is dependent upon accepting an ideology that refuses to admit it is an ideology, and all of this is socioeconomic nonsense. Inter-governmental institutions, such as the International Monetary Fund (IMF), have for many years demanded a commitment from governments of impoverished nations to accept the imposition of austerity measures in exchange for functioning as a lender of last resort. The terms for such IMF bailouts are technically known as “conditionalities”. Conditionalities generally involve a number of requirements and some of these may indeed be beneficial. The IMF may, for example, insist upon anti-corruption measures. But mostly the IMF will insist upon “free market reforms”, which means, in short, a tough austerity package to dismantle the nation’s welfare system, with the forced privatisation of key public services, along with the imposition of “trade liberalisation” and deregulation. Under such a programme, with the country being required, in effect, to give up it economic sovereignty, it is suddenly open to vulture capitalism, and ready to be asset-stripped by global corporations. This package of conditionalities, or “market-friendly policies”, was known as the Washington Consensus, although it might more aptly have been renamed the “Chicago Concensus” given that these rules for “economic reform” were predicated on the hardline neoliberal dogma developed by the Chicago School, and then first tested by the so-called Chicago Boys, who imposed them as economic “Shock Therapy” during the terrible years of the Pinochet dictatorship in Chile. In any case, the name Washington Consensus became so sullied that the IMF have dropped it altogether. But only the tone of the IMF has been softened, as the demands being made of Greece and Portugal now show. They are still in the business of dismantling welfare systems and the wholesale privatisation of nations. “The experience of austerity measures imposed on developing countries should sound alarm bells for us all. These measures are not a new innovation; they were cooked up by Thatcher and Reagan in the 1980s and forced onto developing countries by the IMF and World Bank. The effects were devastating: inequality, poverty and injustice increased as public services and welfare spending were slashed. says Deborah Doane, director of the World Development Movement. says Deborah Doane in the same article. The maths is actually quite simple here. If you cut government spending, especially during times when the private sector economy is also struggling, then the knock-on effect is that tax revenues are reduced, and this then increases the deficit. The outcome being precisely the opposite to that demanded. But austerity isn’t simply doomed to failure, it is doomed to devastating failure. It leaves the country concerned with nothing but mass unemployment and even greater debts to repay. It took a century for the people of Europe to win our economic rights, but we are now on the verge of throwing that inheritance away. People all around the world aspire to enjoy the same rights. We should not let them down. In an attempt to offer an alternative to TINA, I have put together this five-point alternative plan. I believe that something of this sort needs to be agreed upon by all groups who now stand opposed to the government (and IMF supported) programme of austerity measures. I would very much welcome any constructive comments, amendments, or corrections; and if you are interested in helping to take the idea further then do please get in touch. The current crisis didn’t just happen for no reason. If it were simply a part of some kind of quasi-natural but ultimately mysterious boom and bust cycle, then we might hope to simply grit our teeth and ride it out. There is, unfortunately, no evidence that supports such a conviction. The current crisis did not originate because of fiscal mismanagement and government overspending. The problems in Greece, for instance, did not arise simply because of their long-standing problems with tax receipts, any more than the recession in America began with subprime mortgages and the housing bubble. The individual crises of these various nation states are merely symptoms of more than two decades of unregulated greed and corruption in Wall Street and The City of London. The results of a systemic failure, which cannot be resolved therefore until the current financial system is itself overhauled. The current crisis has happened because the speculators and financiers gathered so much power that they have taken control of our senior politicians. This is why Obama is surrounded by a coterie of advisers from Goldman Sachs. It is also why Peter Mandelson and George Osborne were found cosying up together aboard a Russian oligarch’s yacht at one of Nathan Rothschild’s lavish parties. For no dog can have two masters. To make sure they are working for us then, such obscene cronyism has to be rooted out, and, so far as it’s possible, legislated against. Ever since the crash of 2008, the banks have been playing the suicide card. Holding us hostage with a gun pointed to their own heads. Give us your money or everything goes down with us, they threaten, and their close friends in the media and government play along, perpetuating the myth that they are simply “too big to fail”. They want us to forget about their malpractice and criminal fraud that caused the crisis, and to carry on stumping up the interest for debts so enormous they can never be repaid. We need an investigation. We need an international debt moratorium followed by cancellation of all debt found to be odious. The endless bailouts only serve the bankers and these must end. Meanwhile private savings and pension funds need to be protected. But if Goldman Sachs closes down then so be it. We’ll pick up the pieces later. This current crisis really owes its origins to the policies of Thatcher and Reagan. Everything would have been avoided if it hadn’t been for the deregulation of the markets which began back in the 1980s. Allowing the bankers to police themselves turned out to be a bad idea. We might have guessed. The underlying cause of the current crisis is the worldwide trade in “derivatives”. It is currently estimated that in the order of a quadrillion US dollars (yes, that’s with a qu-) has been staked on derivations of various kinds. We can compare this with the entire world GDP which turns out to be a mere 60 trillion US dollars2. One quadrillion being more than twenty times larger. Or we might compare it against the estimated monetary wealth of the whole world: about $75 trillion in real estate, and a further $100 trillion in world stock and bonds. So one quadrillion is a number exceeding even the absolute monetary value of the entire world! Warren Buffett once described derivatives as “financial weapons of mass destruction”, and he should know because he trades in them. We must place a ban, if not on all derivatives, then certainly on the most toxic varieties such as credit-default swaps. There should also be a criminal investigation that looks into the sale of so many “toxic assets” and considers the role of the credit ratings agencies which graded them triple-A. The very same rating agencies that are now downgrading countries such as Greece, Portugal and Ireland. A separation of investment banking from depository banking would at least have protected ordinary savers from the whims of the speculators. In America such a separation had existed since the Banking Act of 1933, known as the Glass-Steagall Act, until Bill Clinton repealed the law in 1999. Legislation along the lines of Glass-Steagall needs to be brought back. Tax is a dirty word but if the deficit is to be redressed then government revenue will need to be increased. Politicians talk a great deal about fairness and we should hold them to this. The people who caused the crisis should now be bailing us out. There has been some talk of a Tobin tax on all transactions in the financial markets, and even at the very low rates of 0.05% being proposed by some groups, hundreds of billions of pounds would be raised annually. So why not levy a Tobin tax at a higher rate, say 1% (which is a tiny fraction when compared to any tax the rest of us pay) and then use that money to repay the national debt? Gordon Brown came into office on the promise of closing tax loopholes but did nothing of the kind. Major corporations simply don’t pay their fair share. They move their operations offshore by taking advantage of the many tax havens available, the majority of which are British dependencies. It is estimated that tax havens drain the UK economy of around £25bn annually through their role in tax avoidance and evasion, and that hundreds of billions are lost globally each year.3 Money that should be paying for education and healthcare. We should resist any rises in the sorts of stealth taxes on the poor and the middle class which the government are likely to propose, no matter how temptingly packaged they may appear. “Quantitative Easing”, which is a deliberately impressive and misleading term for what is simply the printing of extra money, is an inherently inflationary strategy. It is, therefore, the most insidious stealth tax of all. Let’s find the money in fairer ways, by forcing the corporations and the super-rich to pay their dues. Meanwhile, the wars in Afghanistan and Iraq have already cost British taxpayers more than £20billion, and this does not even include the salaries of soldiers or paying for their long-term injuries and mental health care.6 Acute care for the troops most seriously injured in Afghanistan is costing the government more than £500,000 every week.7 And all for what? Putting an end to these imperialist adventures is not only a moral imperative, it is an economic necessity. Running a nation’s economy is not the same as running a household budget. Making cuts in government spending may save money, but with reduced investment there must come an inevitable kick-back. The economy will shrink and with less tax revenue available the deficit then grows. And this becomes a vicious cycle. In order to stop such a debt spiral turning into depression, the government needs to spend rather than save. This is what the post-war Attlee government did when it expanded the welfare state and founded the National Health Service. Reinvestment in public services and infrastructure can put money in people’s pockets again. Meanwhile, investment in manufacturing and industry would help to reduce our balance of payments deficit. During times of depression government investment becomes essential. We need investment to revive Britain’s once strong manufacturing base. This can involve tax or other incentives and will most certainly require significant cash injections to support established industries and encourage new production and innovation. In the meantime, we should roll back the privatisation of our public sector, of schools and prisons (how outrageous that companies can profit from locking people up), and most urgently, of the NHS. In a fully privatised world, which is the dream of neoliberal economists, we all fall prey to the markets. So let’s abandon our current obsession with private enterprise and move back to a more mixed-economy, adopting a policy of dirigisme. In this spirit, we might decide to take state control of any struggling key industries, as well as re-nationalising the natural monopolies of water and energy supply. It is high time to rebuild our infrastructure, since this is the bedrock for all social and economic progress: and examples of the sorts of projects we should consider include the long overdue upgrading of our railway system; the installation of countrywide fibre-optic broadband; the construction of new power plants including the proposed tide power barrage across the Severn estuary, which alone could supply more than 5% of our current electricity demands; and then there are more ambitious schemes, such as protecting ourselves against future water shortages by building a national water grid. We need to seize this as an opportunity to do all the things we ought to have done years ago because the future will belong to those who invested wisely – which means funneling our money into rebuilding industry, reconstructing our infrastructure, and supporting new areas of scientific research and development instead of frittering it away on banker bailouts and bonuses. Let’s build a country that’s fit and proper for the twenty-first century. Such a New Deal programme was how Franklin Roosevelt rescued the US economy during the last Great Depression. Between 1933 and 1936, Roosevelt implemented the “3 Rs”: Relief for the unemployed and poor, Recovery of the economy to normal levels, and Reform of the financial system to prevent a repeat depression. Roosevelt’s New Deal is perhaps the best example of the kind of forward-thinking programme of economic measures that is so desperately needed today.